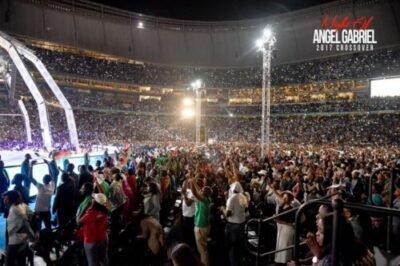 Management of Africa’s largest soccer arena, FNB Stadium in South Africa, has named Prophet Shepherd Bushiri as Africa’s most crowd puller after yet another successful Crossover Night which attracted over 100 000 people. The management, which is to make a statement , confided in Nyasa Times that Prophet Bushiri deserves the honour not just for attracting the 2017/18 year’s feat; rather, for consistently maintaining the feat for the past three years. Sources from FNB management told Nyasa Times that in the 29 years of FNB Stadium’s operation, no person has ever done what Prophet Bushiri keeps achieving by consistently filling the stadium with ever increasing figures. It’s unprecedented, it’s historical and it deserves special and higher recognition in South Africa’s history of events management and crowd mobilization, he said. FNB stadium capacity, after completion of its construction in 1989, was 80 000 spectators. Twenty years later, the stadium received a major upgrade in preparation for the 2010 World Cup—going up to 95 000 spectators. However, when Prophet Bushiri started holding Crossover Nights in 2015, the attendance has been filling to capacity plus slight excess—owing to the fact that thousands of others get seated on the playing field. Since the first 2015/16 Crossover Night, dubbed the Night of Lion of Judah; through the 2016/17 one, dubbed Night of Honey; Prophet Bushiri has been a consistent crowd puller with the recent one, dubbed Night of Angel Gabriel, seeing 100 000 tickets, selling at R10, selling out in 9 days. Even if organizers squeezed in and produced 2 000 more tickets, it didn’t help either because, in a day, they were all over. To mean, they were thousands others who could not make it to the event because of capacity issues. In an interview with Nyasa Times after the event, Prophet Bushiri—who is the leader of Enlightened Christian Gathering (ECG) and Prophet Shepherd Bushiri Ministries International—didn’t say much only attributing everything to God’s grace. “There is nothing I can do just with my hands. All what you see here is because of God’s grace and love for our ministry,” he said and refused to comment further. During the teaching, the Prophet unpacked the message of Angel Gabriel underlining that the choice of the theme doesn’t, in any way, imply the worship of the angel. In explaining about Angel Gabriel and its relevance in forming the event’s theme, the Prophet reckoned that this particular angel is a messenger who is fond of bringing good news to people and further contextualised that believers should brace for good news in the year 2018. He further indicated that angel Gabriel appeared to at least three people in the Bible, first to the prophet Daniel, to whom he explained a vision that he had; next to the priest Zechariah to foretell and announce the miraculous birth of John the Baptist; and finally to the virgin Mary to tell her that she would conceive and give birth to Jesus. Most importantly, the Prophet called upon to stand strong in prayer and fasting, saying that these are practices that create an attractive environment for visitation of angel Gabriel. Addressing questions whether the event was about worshiping angel Gabriel, the Prophet narrated that angels are not there to be worshiped and neither was the event about worshiping angel Gabriel. The Prophet also clarified about stories going round about using FNB ticket money to enrich himself. He said that the entire event has a R11 million budget. The R10 tickets, he said, was too minimal that the money realised was only used to produce the tickets which were principally for control purposes. He underlined that much of the money used for the event came from his personal accounts. Prophet Bushiri is a successful businessperson who is a president and founder of Shepherd Bushiri Investments (SBI), an investment companies with various entities such as hotels, airlines, consultancy agencies, mobile networks, mining, to name but a few.